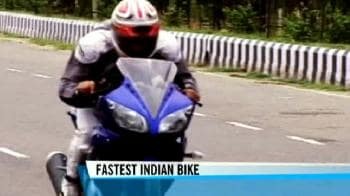 *Actual On Road Price of Bajaj Pulsar 220F at the dealership may vary. The performance oriented Pulsar 220 is an affordable option for customers in its segment featuring a four stroke, DTS-i, oil-cooled, single cylinder powertrain. Displacing 220cc, the engine works out top power of 20.65bhp at 8500 rpm along with peak torque of 18.55Nm at 7000rpm.Bajaj Pulsar 220 uses telescopic forks in front and 5 step adjustable nitrox shock absorbers at back for supporting and balancing the bike on road. Power on the other hand is barred by 260mm and 230mm disc brakes up front and rear. Comfortable seating posture, LED tail lamp, sporty split seats, split grab rails, electric start, engine kill switch, self cancelling indicators are some of the vital features offered on the bike. Very good built guality ,Best performance, mileage is good like 50-54kmpl, projecter head lamps,overall best bike in indian motars and a very very good comfort compare to other bikes. My bike is pulsar 220. Its superb and comfortable. My bike mileage 45kmpl.